It is rare for a Bucks County divorce to not include a component of property division or what is formally called “equitable distribution”. Because Pennsylvania is an equitable distribution state, Bucks County courts divide marital assets and debts based upon principles of equity, or “fairness”. This does not necessarily mean a 50/50 division, but what is most equitable. From homes to cars to household furnishings, equitable distribution can become very complicated. Many factors are taken into account in dividing the marital estate. It is important to understand and utilize accepted valuation techniques in assessing the value and tax ramifications of each marital asset so that the marital property may be divided in a manner advantageous to the client. One key point to make: The Bucks County Family Court does not consider marital fault during property division. From simple to complex, amicable to contentious, our Bucks County divorce attorneys have effectively handled all types of divorce matters. We understand that dissolving a marriage impacts the entire family. Our role is to manage the divorce process efficiently so as to minimize emotional impact. We will advocate and negotiate for you and protect your interest in the marital estate both during and after the divorce matter concludes. As a Bucks County client, you have the benefit of our experience in sophisticated asset valuation, which is vital to equitable distribution. 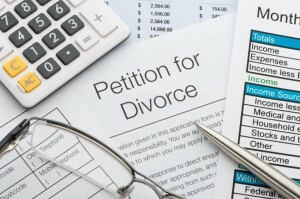 Joint debts are also a factor in finalizing a divorce in Bucks County. These may include credit card debt, mortgages, student loans, and auto loans. It is important to factor in the responsibility of the debt when dividing assets. Please note: Even if a person brings an asset into the marriage, if the asset increases in value (i.e. stock price increases) then the accretion of value is a marital asset. In a Bucks County divorce, it is important for the represented spouse to fight for their appropriate share of the assets and to not be coerced into accepting less than they are entitled to. If spouses are unable to agree about the division of their marital assets and marital debts, the spouses may elect to engage in the formal court in Bucks County process for equitable distribution. The decision of whether to negotiate a settlement without or not to go through the court process and possibly a trial often involves a cost-benefit analysis.